So you’ve been asked to bring a dish for Thanksgiving this year? Or, worse yet, you’re in charge of cooking the whole darn meal for a bunch of people? 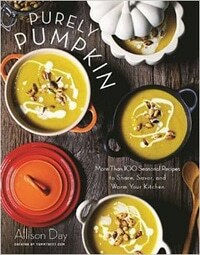 Fear not — these brand-new Thanksgiving cookbooks are here to help. Whether you’re doing it all or just bringing a pie to share, you’ll find easy recipes and handy tips for holiday cooking. And pumpkin spice lovers, we have something special just for you! What would Thanksgiving be without pie? Whether you’re a pumpkin purist, a sweet potato lover, or a fan of the fruit pie, it just wouldn’t be the same without a pie (or three) in the holiday spread. 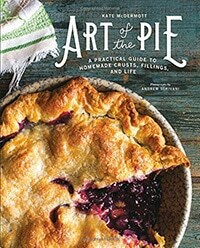 Take your pie game to the next level with this beginner-friendly, gorgeously photographed cookbook. Gluten-free pie crust recipes are included, plus enough filling options to keep you baking all year round. Loaded with tips and tricks for making the perfect pie, this cookbook will make sure you’re never short of Thanksgiving dinner invitations. I could never really achieve a picture-perfect Williams-Sonoma life, but I do like to pretend it’s a possibility. With their new Thanksgiving cookbook, I can indulge my fantasies and maybe — maybe — give one of the simpler side dishes a try. Over 80 recipes guide you through the entire holiday meal, from cocktails and appetizers to main dishes (including non-turkey options), savory sides and indulgent desserts. I drooled over the mushroom turnovers, sweet potato biscuits with honey butter, and leftover-friendly turkey banh mi. 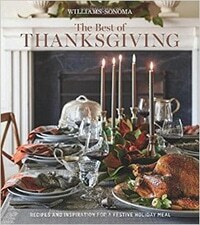 In addition to the recipes, you’ll find tips for organizing and planning the meal, timelines, and carving the bird. As much as I love the old standbys, it’s fun to try new twists on the classics, and there are plenty of great ideas here! How about a little history to go with your turkey and mashed potatoes? This new book takes readers through four centuries of American history, using newspaper articles, historical documents, and cookbooks to shed light on our Thanksgiving traditions. This sometimes controversial holiday has been a battleground for presidential powers and states’ rights, and for some Native Americans, it’s a day of mourning, a time to remember a history of mistreatment and marginalization by colonial settlers. There are also newer traditions, like Giving Tuesday, an opportunity to turn Thanksgiving gratitude into philanthropy. With readings to be read aloud at the table, and historical menus and recipes, this book may very well convince you that Thanksgiving is the most American holiday. Stephanie P. is a writer, editor, and blogger. Her secret shame is dystopian YA fiction. You can find her wherever the books and food are.